Trigger points are accumulations of waste products around a nerve receptor. Often times they feel like nodules or taut bands of fibers within the soft tissues. Trigger points form in muscles which have been overused or injured due to an accident or surgery. Common characteristics are increased muscle tension and muscle shortening. Increased muscle tension is the primary side-effect of trigger points and pain is the most common secondary effect. Trigger points can present themselves as referred patterns of sensation such as sharp pain, dull ache, tingling, pins and needles, hot or cold, as well as can create symptoms such as nausea, ear ache, equilibrium disturbance, or blurred vision. Trigger points can exist in two states, either active or latent. 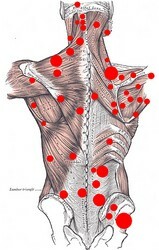 Active trigger points are those which cause discomfort. Latent trigger points wait silently in the muscle for a future stress to activate them. Aches and pains which began in the past become more frequent and severe in intensity as we age. It is common to attribute this discomfort to arthritis instead of our tight muscles which harbor trigger points. To diffuse a trigger point, static compression (pressure) is applied for 10 seconds, released, then pressure applied for 10 more seconds in a pumping action while the client breathes deeply. This action flushes the toxins and calms the nerves. (see pictures on right showing treatment of a stiff neck and as part of a Sports Massage for a runner). Releasing trigger points releases endorphins so the result is elimination of discomfort as well as being energized.